The Smokey Mountains are a mix of excitement and concern for an Appalachian Trail hiker. They are home to almost 1,500 black bears, have well maintained trails, beautiful scenic overlooks and some of the nicest shelters on the AT. But they also require a permit, have packed shelters during peak season and are known for harsh unpredictable weather. I know this going into my south bound journey through the 72 mile Smokey Mountain section of the Appalachian Trail. I have chosen to break it down into two small sections as my anniversary falls in the middle of this trip. The first section will bring me to Newfound Gap, which is about mid-point. I will come off the trail for the weekend to stay with Mike in Gatlinburg. Come check out time on Sunday, it’s back to hiking the section section which will bring me to Fontana Dam. The beginning of the trip is blistery hot. The day I climb Mount Cammerer, it’s in the 90s and I run out of water for the first time. I make it to the water source before Cosby Knob Shelter where I have a permit to sleep. Unfortunately, when I arrive late at 8:00 pm to the shelter, I see over 20 food bags hung on the bear cables. This is a bad sign. I push past the tarp that covers the entrance to the shelter and find over 20 hikers all bedded down for the night. As a side note, the Smokey Mountains has a policy that section hikers and campers have to pick the exact shelters where they want to stay and the exact dates they will be staying. They pay a per night rate to stay in the shelters. If there is not availability, a permit will not be issued and different dates need to be selected. I struggled with finding open times and then thought I was good to go when I finally found open slots. Silly me! 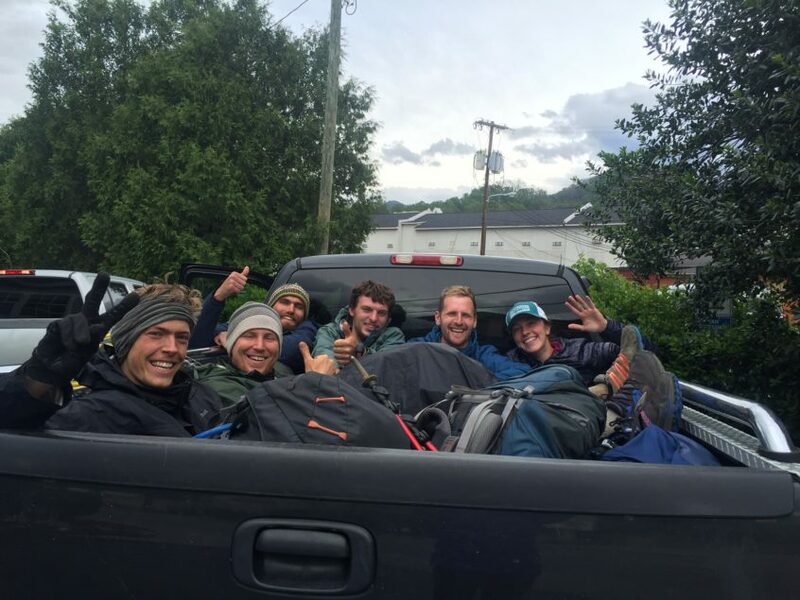 Thru-hikers, on the other hand, pay a single lower price and are given a permit that allows them access to any shelter on any night, provided there is room. In theory, if the shelter is fully occupied by non-thru-hikers with valid permits, the thru-hiker forfeits shelter rights and instead must set up a tent. I’m tired. I know the rules. I say out loud, “well, I have a permit that says I am supposed to stay at this specific shelter on this specific night so I guess you’re just going to have to make room for me.” An older male hiker sympathetically comments that other than the six people in his party, the rest are thru hikers who have conveniently ignored stated policy: Thru-Hikers must always give up bunk space in shelters to those with shelter reservations. I nod but also recognize the pointless of rules that can’t be enforced. Plus, I also empathize with thru-hikers who do have a more challenging goal then section hikers like me. Although, by this time in my journey, I have put in as many miles as the North Bounders in this shelter. I surrender to the scene and find a very narrow space on the shelf in front of the official bunk row. It just happens to be in front of the girl who told me to leave. She gives me a dirty look before pulling her sleeping bag over her head to retire for the night. The tension is still present but soon fades as everyone is tired and in need of sleep. As soon as I settle into my own sleeping bag, I see an enormously large mouse scurry over our hanging back packs. I ask myself, how can a mouse get that big? I leave at sunrise and shake off the negativity from last night. I make a mental note to arrive before 5:00 pm to shelters if I want a better chance of getting a bunk space. It’s a full 14 mile day but I manage to arrive at the next shelter before dinner. To my surprise, it’s deserted. I shake my head thinking about the contrast to the previous shelter. What is going on? Last night I must have run into the bubble. The bubble refers to the large group of North Bound thru-hikers who start within weeks of each other often creating a traffic jam of sorts along the way. Eventually, a couple arrives at the campsite followed by a guy who looks like he is going to vomit. The guy is only a day into hiking and is majorly struggling. Another couple and a European man who could easily be on the cover of GQ walk into camp. The conversation turns to the incoming storm. Several individuals have received text alerts of incoming snow and up to 70 mph winds. Hikers are being asked to evacuate. This seems a little bit dramatic considering the blistery weather just a day ago but then again, this is what the Smokies are known for. I set an alarm to wake up early and get my 12 mile day knocked out by lunchtime if at all possible. The winds make their appearance before sunrise. I am concerned about the narrow ridges I must walk across. In some spots the trail is only 2′ wide and erosion is winning. The terrain combined with the 70 mph winds make this my most dangerous day on the Appalachian Trail to date. For motivation, I sing church tunes from when I was a kid at the top of my lungs. “Be not afraid, I go before you always…” I decide the person who wrote the song doesn’t know about positive word choice so I change the lyrics to, “be safe and calm, I go before you always.” I like this better. I see no one all morning. The storm is picking up. The ground around a huge tree is heaving as its roots emerge. This tells me to be careful. I watch the tree and wait for a break in the wind. When it happens, I run past the tree as safely as possible with my full pack. I continue walking for about another minute before I hear the sound of it falling. I cringe and push on. The section near Charlie’s Bunion will be the last ridge and then it should start to feel more safe. I feel almost giddy by the time I arrive at the Newfound Gap parking lot. On the sunny day when I left my truck, there were over 100 vehicles and tourists everywhere. Today the are only a half a dozen vehicles presumably left by hikers like me. And the road to town has been closed due to the storm. As I get to my truck, I see two older men emerge from the trail, then a younger one. I ask them if they want a ride into Gaitlinburg. They gratefully say yes. Then I notice a whole slew of other hikers camping out in the restrooms. I tell them they are welcome to pack into the back of my truck and we will try to get through the closed road. They are ecstatic and appreciative. We take off and a game of Frogger begins with my truck weaving around fallen branches and small trees. Occasionally, the truck’s tire will go over a limb and it will fly up into the air. I check the rear view mirror when this happens to make sure nobody in the back ends up hit by the debris. Each time I look, I smile because I see my cargo laughing and having fun. We get to a curve where there is a large fallen tree and another truck that has been forced to a stop. This tree can’t be driven around. Two men from the other truck ask if we have a chainsaw. I shake my head. They say they have a hatchet and a hacksaw but it will be a slow process. Everyone jumps out the back of the truck and helps with the tedious chore of cutting the tree with hand tools. It takes a little under an hour, but adrenaline wins in the end and we get through. By the time we get down the winding closed road and to the edge of town, our spirits sink because we notice that Gatlinburg is without power due to the storm. Love hearing about your journey. Glad you had a chance to BE.